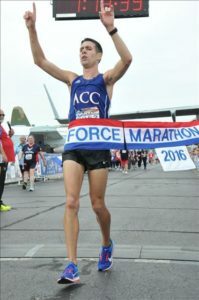 Can you tell you me about the MAJCOM Challenge? 10-person teams will be selected to represent their respective MAJCOMs. Team composition will be made up of the following: Full Marathon = 3 males and 1 female. Half Marathon = 4 males and 2 females. The following MAJCOMs are funded: ACC, AETC, AFGSC, AFMC, AFRC, AFSOC, AFSPC, AMC, USAFE and PACAF. Individuals selected to represent their MAJCOM may attend in a permissive TDY status as authorized by AFI 36-3003, Military Leave Program. Team members will receive uniforms and portions of travel, registration, and lodging reimbursed. 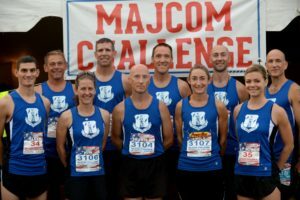 How do I register for the MAJCOM Challenge? Registration runs from 1 Feb 2019 – 1 May 2019. No late applications will be accepted. All applications must be completed and submitted through APPTRAC. To fill out and submit your application through APPTRAC, click here. For instructions on how to create an APPTRAC account and complete your application, click here and view the file named ‘APPTRAC DCS Training Slides V3’ under the ‘What’s New’ section of the page. When will I know if I make my MAJCOM team? If you are selected to be a member of your MAJCOM team, you will be notified in June.